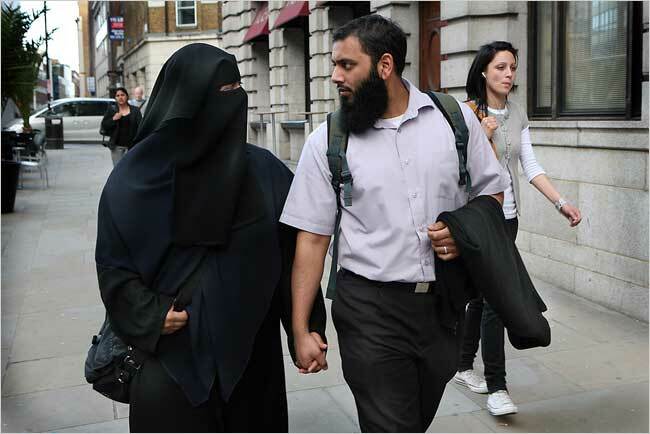 LONDON, June 16 — Increasingly, Muslim women in Britain take their children to school and run errands covered head to toe in flowing black gowns that allow only a slit for their eyes. On a Sunday afternoon in Hyde Park, groups of black-clad Muslim women relaxed on the green baize lawn among the in-line skaters and badminton players. Their appearance, like little else, has unnerved other Britons, testing the limits of tolerance here and fueling the debate over the role of Muslims in British life. This story is a fascinating example of how public life in liberal-democratic societies depends on specific norms of visibility. Why is wearing the niqab in public so transgressive? The mere fact of cultural difference will account for some of the reactions, of course, but not for the intensity of the emotions involved. Consider also that the woman under the veil could be seen to be enacting her right to privacy. That liberal norm can’t come close, however, to balancing the profound rupture that occurs simply by denying others the opportunity to see you in public. The veil says that one is there but not there, present yet being withheld. This image threatens, perhaps because it creates a different kind of stranger than what we are used to as we pass one another on sidewalks and other public spaces. Or perhaps it challenges the idea that we are surrounded by individuals rather than types, groups, classes . . . Individuality requires constant social construction, not least through our use of images. 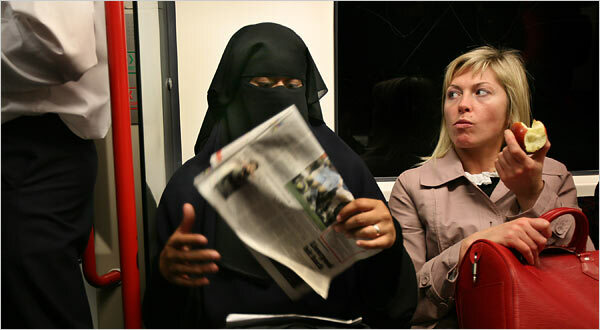 In any case, the niqab demonstrates how important it is to see and be seen according to culturally specific norms of visibility, and how political cultures differ in part by having different optics, and how liberal-democratic public culture depends on continual iteration of norms of individual expressiveness and social transparency. The traumatic image of an unknowable woman acting on her own has been replaced with a heteronormative snapshot of a woman and her husband holding hands. She now can be read through him, and he is at least visible and somewhat legible. The gender politics of this issue are very complicated, as feminism gets entangled with colonialism, and others can go there better than I can. Note, however, how this dimension plays out in the two photos, and not innocently. In the first image, the fundamental antagonism is portrayed as if between two women: the emancipated woman against one under the veil. Guess which one is unhappy? In the second, social acceptance and personal happiness comes tied to a reassertion of patriarchy, which now acquires new significance as the male bears the weight of the social gaze. I think this becomes more complex if we consider that, rather than looking at different types of individuals (enlightened/unenlightened, western/eastern, male/female), we are looking at something else entirely, and not in the sense we generally ascribe the publics today–conditions of contingency and circulation, for instance. We could describe this as a “different kind of stranger”; or, at the very least, we might say that it’s not about the “woman” under the shawl, in whatever context, and certainly not about individuality. To put it differently: Is the image of this woman (another interesting question: are there cross-dressing men wearing these shawls, non-muslim women wearing them, etc etc?) any more or less traumatic when shown walking down the street with a man than when being gawked at by a female subway rider? Does her palpable–visible–absence from norms of publicity necessarily denote something “positive” (as in forceful) going on in society, or could it be giving us an image of the possibility of anonymity in public, a sort of long-lost liberal dream? I suspect it depends on the viewer and exactly how much we’re willing to think about context. It does mean, however, that the visual treatment of this issue must be different than the public treatment of it, and that the nature of this “demand for visibility” has to be understood beyond any agential framework (eg, certain strands of feminism). I don’t just mean this, as above, in the context of charting circulation or cultural flows of meaning on the possibility of agency or individuality. Instead, I think I’m trying to say that even if we can attribute these “traumatic” qualities to these images, we need to think about what eludes a theory of agency in respect to the images we are reading. When did the website show up, by the way? It looks great. Welcome to the Blogosphere, guys. Very impressive site. Have either of you taken a look at Jeff Wall’s work? I went to the retrospective at the MOMA in NYC in March when I was at 4C’s, and was blown away. Here’s the online exhibit: http://moma.org/exhibitions/2007/jeffwall/ It’s coming to the Art Institute of Chicago in September, I think. Anyway, since Wall turns the conventions of documentary photography into (more or less) High Art, I thought it would be of interest. The sheer size (and backlighting) of the photos are hard to grasp online, though. I like Randall’s suggestion that the image of the woman under the veil could be “giving us an image of the possibility of anonymity in public, a sort of long-lost liberal dream.” That may be part of the image’s complex mixture of transgression and appeal. For a related example, go back to the first photo: note how the veiled woman is holding a newspaper, symbol of the public use of reason in the republic of letters. She is at once not public (veiled) and yet explicitly aligned with the most legitimate form of the public media. By contrast, again, look at the woman beside her: the liberated, Western woman is not reading but rather defined by consumption as she is holding a large purse and caught in the act of eating. Worse yet, she’s eating an apple: like Eve, she chomps on forbidden fruit. I think this garb would be even more alarming in the USA, as it calls up connections, for me at least, to the Klan, who also are fully robed with only eye slits. PS: Great new blog, congrats! Yeah, right… that wonderful male bearing all that significant social weight for the woman. She must be so happy that he is there, bareheaded to the world!